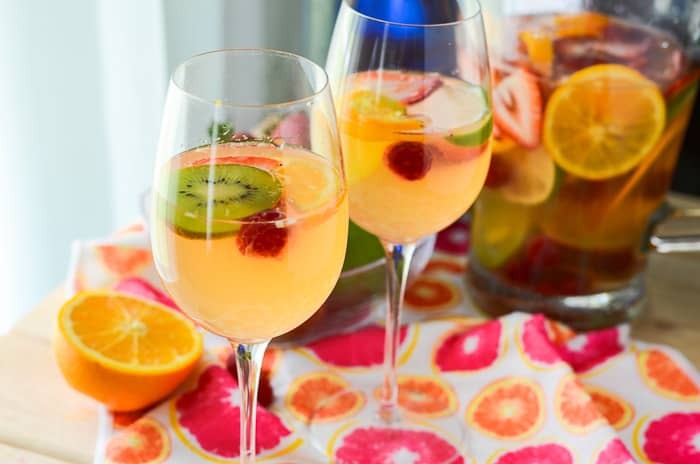 Sweet, bubbly, and aromatic, this fruity Spring Moscato Sangria is steeped in citrus, berries, and kiwi, and is perfect for any springtime get-together! Spring is here and in full force! We’ve had the most incredibly beautiful spring weather down here in sunny Florida this past week, and it’s put me in the most relaxed mood. It’s weather like this that makes me appreciate my home state. Fall is my favorite season down here, but early spring is a close second – when it’s not 90 degrees, at least. The lovely breezes, perfect temperature, and low humidity have motivated me to actually go outside (which, if you know me, is a difficult feat), do yard work, tend our little garden, and take care of this bloggy business from my hammock instead of the comfort of the air conditioner. 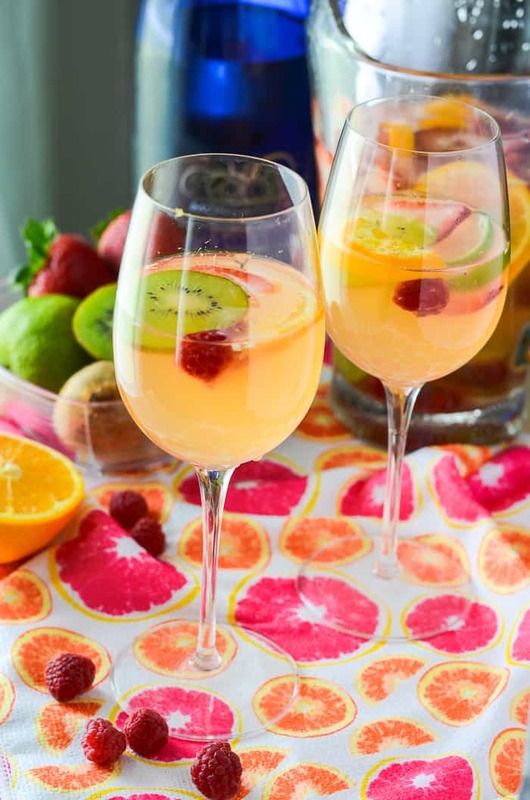 It’s also inspired me to whip up some lovely poolside-type drinks – and what better way to start than with a bubbly, fruity sangria recipe?! Gardening. Who’s down with that? I’ve always loved the idea of being able to go to your own backyard and pick the fresh basil for your caprese, the cucumbers for your salad, the oranges for your juice. Just a small, easily sustainable family garden filled with the fruits, veggies, and herbs you use most often. So, I got this wild hair to try it out for real a couple of years back, and Abe built me a lovely raised bed to plant this dream garden in. Going in to this and knowing what a black thumb I have, I was super worried that I wouldn’t even be able to get the seeds to sprout. Like, they’d sit under the soil knowing they were just going to die anyway, and just give up before even coming up for air. Seriously. I’ve killed the hardiest of houseplants. No idea how. I water them like I should, give them sunlight, have those little crazy cat lady chats with them that they apparently need. No go. I somehow managed to kill some awesome bamboo shoots I bought from IKEA a couple of years ago in the past few weeks. Do you know how hard it is to kill bamboo?! I’ve gone through so many of those grocery store basil plants, too. I get them quite often because they always have a lot of leaves, and it’s way frugal to grow at home than to constantly buy the overpriced, pre-cut springs. I’m pretty sure those aren’t meant to last, anyway, but no matter how I try, I just can’t get them to thrive in or outdoors! I’m just super out of touch with nature, I guess. Last summer, my garden bed experiment went better than expected. We bought a baby lime tree that’s still thriving. I had zucchini and yellow squash planted, and they actually sprouted flower buds! My tomatoes are still growing slower than I think they should, but we planted some sprouted onion bulbs and a big basil bush that’s not dead yet! We had a lot of heavy rain a couple of weeks ago that absolutely murdered quite a few of the seedlings I was hardening, though. I was pretty bummed that I didn’t think to pull them in to the patio and out of the deluge. Pinterest made gardening seem so easy. If I had more time on my hands, I’m sure I’d be HGTV ready. 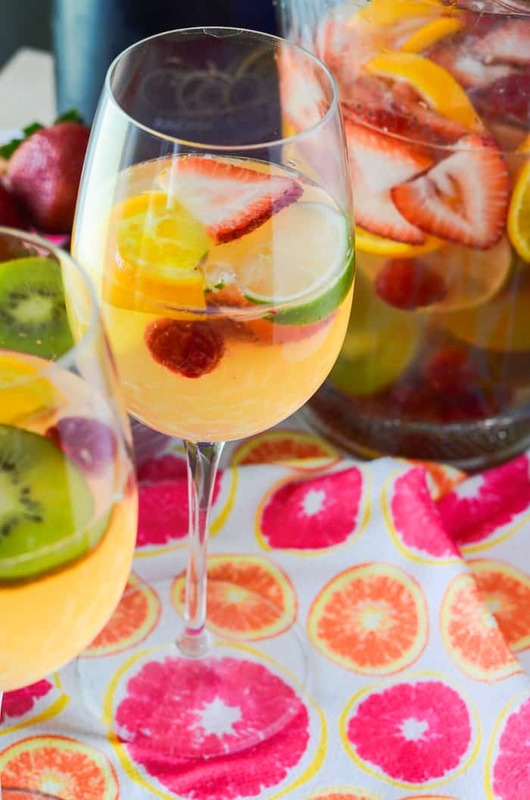 One of these days, though, I’m determined to make this Moscato Sangria with homegrown fresh fruits! This cocktail is seriously the most delicious drink I’ve had in months. I’m a huge fan of Moscato di Asti – it was the wine that made me decide I liked wine so many years ago. Of course, drinking a glass of moscato wine is like downing liquid alcoholic candy, so if you enjoy sweets, it’s hard not to enjoy it. When I think of spring, I think of strawberries and citrus (kinda all over the place down here), and light, bubbly flavors. 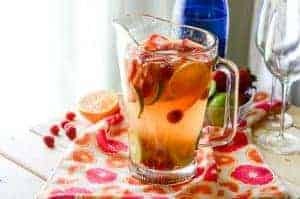 I came across a tasty sounding Ocean Spray juice while shopping for ingredients for this, and I decided to add it instead of the lemon lime soda I had planned on; turns out, it complements the wine and fruits I chose even better than the soda would have! How do you make a sangria with Moscato? 1. Combine orange juice, lime juice, tequila, and triple sec in a large pitcher. Stir, then add mango pineapple juice. 2. Add all sliced fruit to juice and stir, muddling slightly. 3. Refrigerate for at least 1 hour. 4. When ready to serve, add chilled Moscato di Asti to pitcher and stir. 5. Before serving, place a few pieces of steeped fruit in each glass, then pour sangria on top. 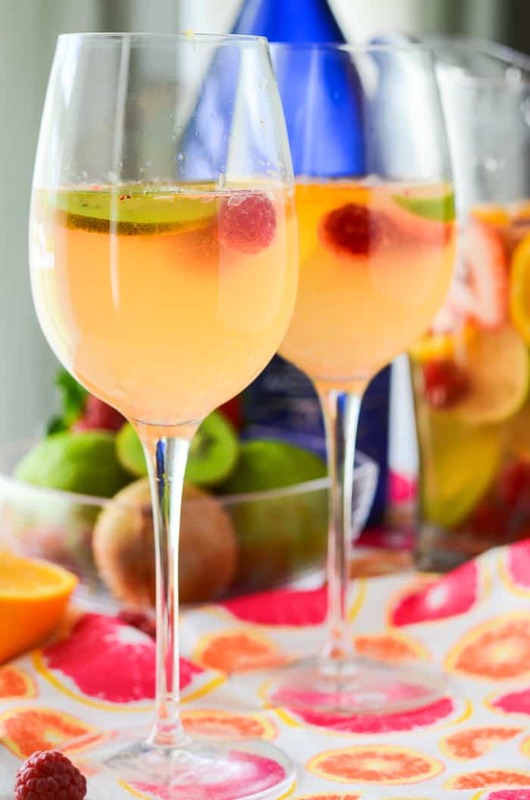 Add ice if desired, and enjoy this refreshing moscato sangria with everyone you love! This Moscato sangria needs no added sugar – it’s sweet enough from the wine and fruity flavors in the juice. Toss in a little tequila and triple sec, and you’ve got yourself a lovely drink for sitting by the pool, in your patio lounger or hammock, or even your couch if you’re the indoorsy type. In my case, it’s been my pick-me-up during my adventures in gardening. Maybe that’s what the plants need! A little garden cocktail. 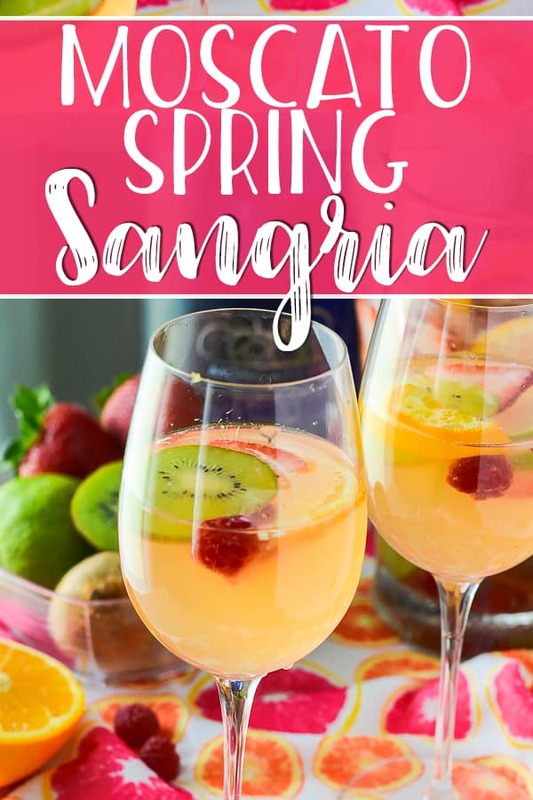 Want to try another refreshing spring sangria? These will also make delish summer drinks! Combine orange juice, lime juice, tequila, and triple sec in a large pitcher. Stir, then add mango pineapple juice. Add all sliced fruit to juice and stir, muddling slightly. When ready to serve, add chilled Moscato di Asti to pitcher and stir. Place a few pieces of steeped fruit in each glass, then pour sangria on top. Add ice if desired, and enjoy! THIRSTY?! 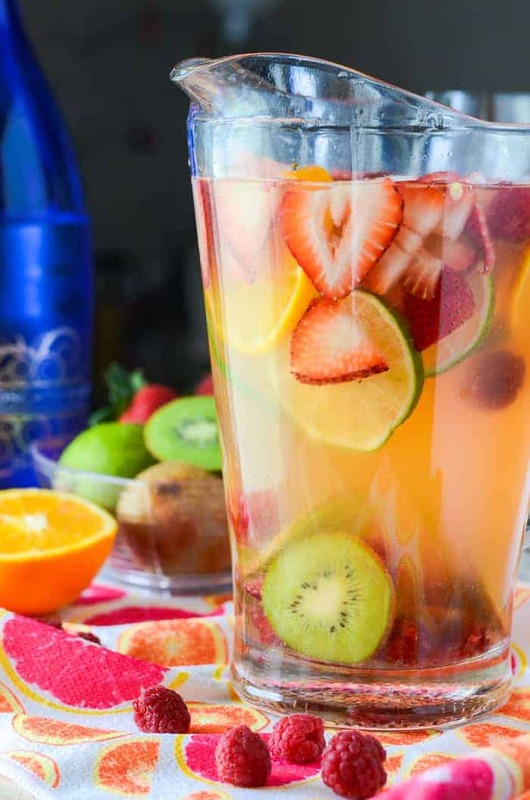 PIN THIS MOSCATO SANGRIA RECIPE FOR LATER! This recipe was originally published on May 6, 2015. It was republished on April 5, 2018. This looks delicious! Perfect timing for cinco de mayo. I would love it if you would link this up to Tipsy Tuesday tomorrow at Grey is the New Black! Oh my! 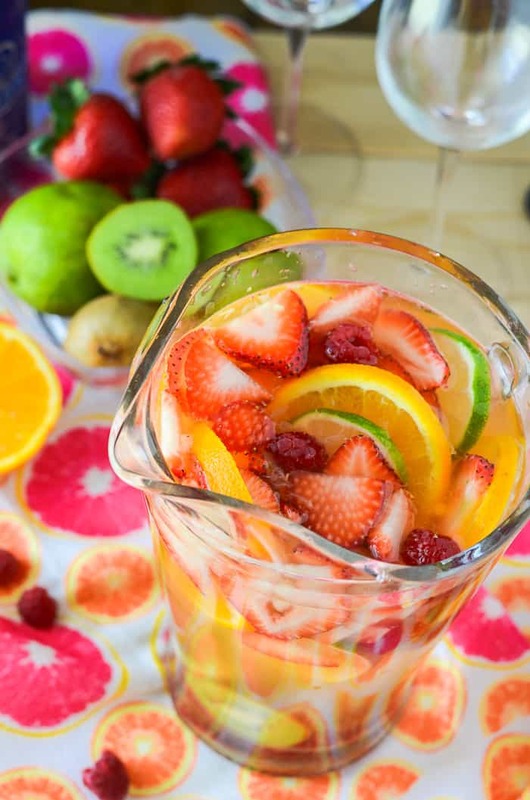 This looks so refreshing and I love how you added all the fruit! im trying my black thumb at gardening this year, too! Only the mint has died so far >_< and I come from a long line of farmers and indoor plant lovers. I missed that trait. I love them but I kill them, somehow. Anywho, this drink!!! Oh it looks scrumptious! How sweet it would be to pick your own berries and toss them in there after a good cleaning =) beautiful! Now that looks delicious, refreshing and sweet just how I like them. I will definitely be making this. I LOVE Sangria and sign my up for one or two of these right now Erica! I love them in summer, but come to think of it, love them in winter too! I love making Sangrias, they are so delicious, my newest drink I have been having is Moscow Mules, love them. I want to make Sangrias for our Mothers Day Brunch. I love this! I’ve always loved the idea of putting fresh fruits into liquids – whether that’s water or alcohol like this. I’m a huge fan of Sangria, but I also love water with slices of green apple in it – it gives it a little extra zing! I have to make this for my friend she would LOVE This omg wow it sounds so delicious! Thank you for sharing! I’ll take one of each please! 🙂 All of the drinks here look really tasty and flavorful. As someone else stated here, they are also a great idea for Cinco de Mayo celebrations. Sangria is one of my favorite things to sip when it’s hot out! I love the addition of kiwi, I’ve never had that in a sangria before!